Home Lifestyle Dining Out Aroi? Aroi maak maak! If you hadn’t noticed, things are tight right now. What with digging the road up, flooding, holes so deep there is Venezuelan music coming from them. It ain’t easy. However, there is a light at the end of the tunnel, provided you find the tunnel! Hot pizza waiting for you. It was two years since we last dined at Aroi, and in that time, the restaurant has changed hands and is now under the command of Peter Emiel De Kegel. 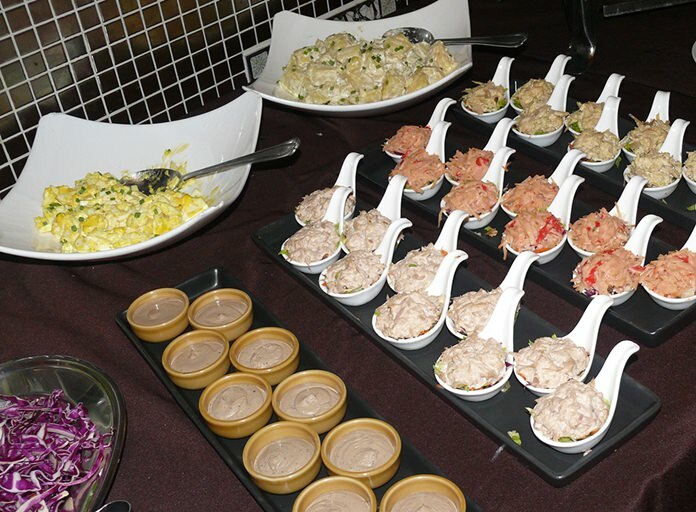 The cuisine has also changed, but the concept of buffets as well as a la carte continues. Let’s get you there first. It is on Soi 89 Sukhumvit, about 700 meters up the soi. However, here comes one of those strange situations, which only Thailand can serve up – there are two Soi 89’s following one another! The Soi 89 you want is the one with a 7-Eleven on the corner, and that is the first Soi 89 on your left leading away from Pattaya, headed south towards Sattahip and just past Underwater World on the other side of Sukhumvit. Once you are on the correct Soi 89 (careful crossing the railway roads) you will see Aroi on your right, opposite a parking area on the left. While we perused the menu, I had a Kwak Belgian beer (B. 245). Eight percent so be careful, but there is even an 11.5 percent Kastel Tripel Belgian beer in his refrigerator. Local beers are B. 70-90. The restaurant itself is a no-frills venue, with a central bar. The buffet tables are set up in front of the bar, with a separate section for the hot buffet from the cold items. Taking the hot items first, these include ribs and roast chicken and on a Sunday this buffet is B. 349. Show me another buffet with ribs under B. 400. And all you can eat! Cold items for the rabbit food. Wednesday = full length spare-ribs, 4 flavors, 269 baht. 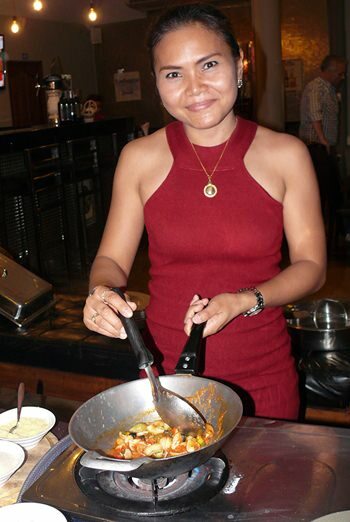 Thursday = pizza, pasta, lasagna buffet, with live cooking station, 299 baht. Friday = mussels Belgian style and brochettes (skewers) 335 baht. Saturday = imported beef (one serve 375 baht), all you can eat 599 baht. Sunday = meat carvery, 349 baht, lamb, chicken rotisserie, spare ribs, 4 kinds of meat, from noon, non-stop till 9 pm. Briefly running through the rather large a la carte menu, this begins with snacks (B. 165-245) with filled baguettes and salmon the most expensive. Starters (B. 90-280) with scampi at the top end leads through to soups (B. 80-100) and then salads (B. 85-235). Mains are heavy on the meat side with imported Australian beef at B. 435 for a 230 gram cut. Lamb chops are B. 395, beef stew B. 260 and burgers B. 165-255. An Italian section promises pasta (B. 170-245) and several pizzas (B. 195-300) with a three cheese at the top. Many Thai items follow with sea bass B. 365 or chicken with oyster sauce B. 120. This venue is very alive, with Peter seemingly everywhere, and obviously thoroughly enjoying his craft as a restaurateur. I overheard him discussing the makings of a pizza with one customer who wanted something different. “I can make one,” was Peter’s reply. And he did. With Aroi’s all-you-can-eat buffets ranging from B. 269 this makes for very inexpensive dining out. There is also a kids play area and Peter stressed that Aroi is a family restaurant. As we were there to review the restaurant we began with a little of the Thursday Italian buffet, starting with a cheese pizza which is kept hot. We then moved to a pan-fried goose liver with rhubarb sauce. One of Peter’s specialties I feel, and it was certainly a great item. He also insisted we try his Australian steak and I wanted medium rare and Madame a medium. Cooked to perfection. Peter knows his steaks. By the way, with our meal we drank an Ottosaldi Barbera del Monferrato which was so enjoyable I bought one bottle to take home. It had been an eye-opener, with the standard of items being much higher than we imagined before going in. The food is definitely “aroi”. Highly recommended. 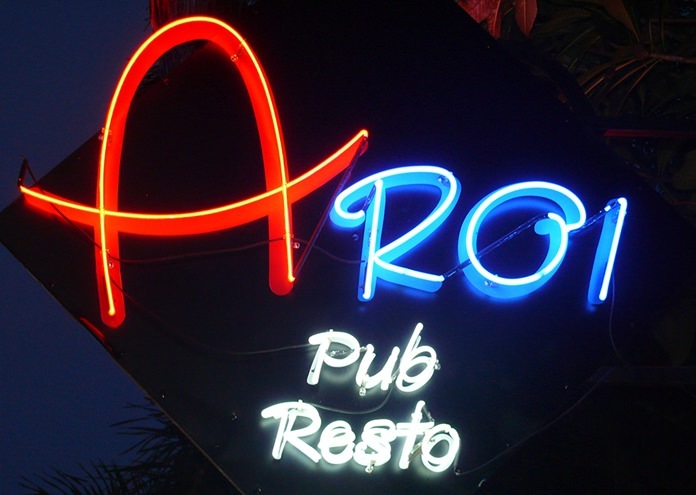 Aroi Resto and Bar, Soi 89 Sukhumvit, on-street parking, hours 12 noon till 10 p.m. six days (closed Mondays), telephone 087 043 3227.